The years 1936 and 1937 were breakthrough years for three of country music’s biggest names: Bill Monroe, the father of bluegrass; Bob Wills, the master of western swing; and Roy Acuff, the king of country. 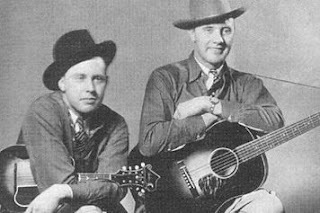 Bill Monroe, the father of bluegrass music, began his recording career as part of a close-harmony singing duo with his brother Charlie. “What Would You Give In Exchange?” was a huge hit for the brothers – so much so that they went on to record three sequels to it. Charlie plays gentle rhythm guitar and Bill adds quiet but superb flourishes on mandolin that only hint at the proficiency he would show later in his career. The mandolin had never before been considered a lead instrument, but then again it had never before been played so adeptly. Earl and Bill Bolick were another close-harmony brother duo, and in fact one of the best. “Sunny Side of Life” was their first hit and an excellent example of their addictive singing style. Just as they stay close but not quite together on harmony, so too they parallel each other on the lyrics during the choruses with enchanting results. One brother draws out words like “happy” and “sunny” while the other says them each twice, adding a dynamic dimension to what had seemed a low-key song. Factor in the sheer magic of the way the brothers’ voices sound together and you have the makings of an amazing record. “Steel Guitar Rag” is a great example of energetic, no-holds-barred western swing. It features Leon McAuliffe in an electrifying performance on electric steel guitar. The steel guitar’s trademark slide sound comes from sustaining notes, so one might think that using it as the lead instrument would make for a slow record. Instead, the rhythm section propels it forward with relentless energy, while McAuliffe adds color by making the steel sing. The other instruments are just as good: Al Stricklin bangs raucously on piano, and Robert “Zeb” McNally gives a rock-and-roll worthy performance on the sax. Little touches like cowbell and shouts from Wills add to the entertainment. “Right or Wrong” shows Wills and company in a slower, but no less compelling context. The vocals are sung by Tommy Duncan, who was the band’s primary vocalist during its heyday from 1933 to 1948. Duncan has the perfect voice for western swing: strong and twangy enough for country, but smooth and sophisticated enough for jazz. The lyrics are wonderfully heartbreaking, and Duncan imbues them with just the right amount of pathos. His band mates are wonderful too, from Wills’ longing fiddle solo at the beginning to the bittersweet melancholy of Everett Stover’s Mexican-style trumpet during the bridge. The sorrowful tension hits a boiling point at the end as Duncan raises his voice to a wail and repeats, “All along I thought I’d lose you!” He then adds a little well-placed yodel to brilliant effect as he brings the song to its conclusion. Roy Acuff is one of country music’s giants and the first person ever inducted into the Country Music Hall of Fame. In addition to being one of the Grand Ole Opry’s biggest stars for decades, he would become one of country music’s most influential people after co-founding Acuff-Rose Music, the first major Nashville-based music publishing company, in 1942. “Great Speckled Bird” was one of his signature songs and his first big hit. Over Clell Sumne’s slow, haunting steel guitar, Acuff reverently sings this popular hymn written by Reverend Guy Smith. The lyrics describe the Bible as a speckled bird, based on Jeremiah 12:9 (“Mine heritage is unto me as a speckled bird, the birds round about are against her…”). Acuff had a good strong voice that came across clearly on radio and record alike. While he could be quite animated, on this record he wisely showed great restraint, measuring his words carefully and allowing the story and Sumne’s ethereal slide work to carry the song.